A few may have seen these updates via email - but as promised (you asked for it) they are replicated here on my blog. 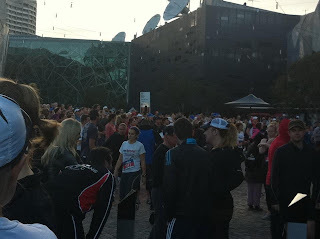 This magnificent event attracted more people than a Carlton vs Collingwood game of aerial ping pong and in their lycra shorts, charity driven t-shirts, long socks and well worn runners etc. the majority of the crowd were better dressed to boot. Being a realist I set myself up in the 60 min+ wave and gravitated towards a couple of fit looking ladies who were holding 65 min balloons. The experts in these matters tell me those ladies run 6 mins and 30 secs per kilometre for the whole distance and therefore you can pace yourself to finish in a target time. 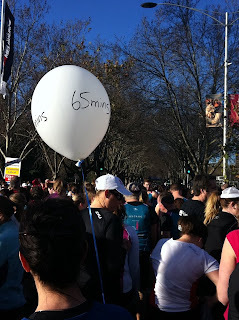 I wasn't dismayed by the fact that they had wrist bands showing each kilometre of speed for the whole ten (eg. 1 km in 6.30, two in 13, three in 19.30 etc.) as I wasn't chasing a future science partner but a time goal. Unfortunately I lost them before the 500 meter mark as the sweat in my eyes blurred my vision (it had nothing to with them being too far away - that's my story and I'm sticking to it). Anyways I did have a goal of running the whole distance (which I did bar a couple of walks through drink stations) and finishing in under 70 mins. My official time (published in "The Age" this morning) was 69.37 - not a breakneck pace but at the same time one that I am quite proud to have achieved - it was a full 3 mins 45 secs faster than my best 10 km run. Now onto my Half Marathon goal in October and I did have a 6.2km training run this morning (in the dark) so obviously pulled up fighting fit. You can still sponsor me using the logo on the right hand side of my blog, or just visit there to see the great messages of support from the donors to date. 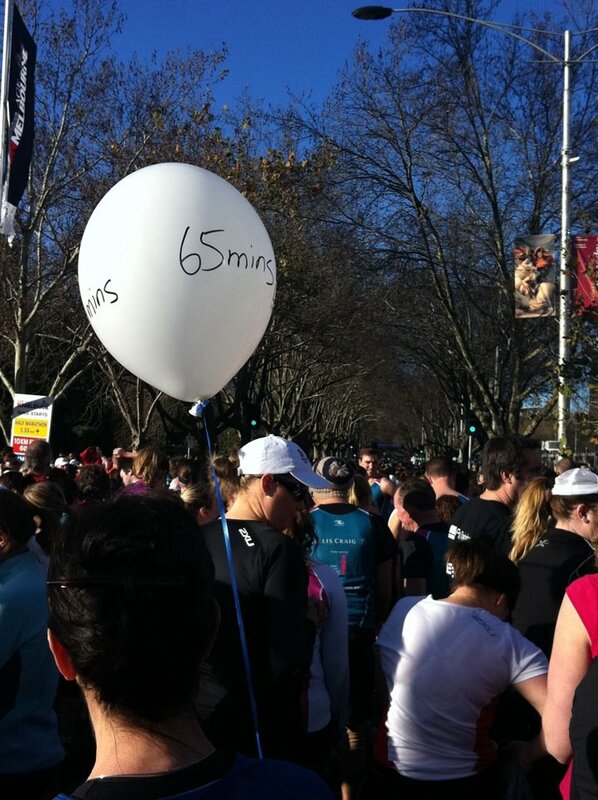 Funds raised are for the Asthma Foundation of Victoria. GPS of my run can be seen here. A couple of months ago a guy who runs ultra-marathons (100km events) volunteered to help me train for the half marathon event in October and being slightly naive in these matters I took him up on his offer. After running in my weekly ParkRun around Albert Park on Saturday (it was 1 degree!!!!) he said "right we're going for a run tomorrow" - so at 10.45am I got the "wake up" sms message - "Hi I am doing a spa session at GESAC so will see you at Duncan McKinnon at 11.30am" - let me give you a tip, don't trust blokes who run 100km events for a hobby, they are a few snags short of a barbie (no offence intended George!!!). My training program said "70 min jog" my training partner thought that meant 70 mins solid jog, then "you've nearly hit 10 kms may as well run the last 200 metres"….."no point in finishing quarter of a lap in, may as well finish the whole lap"….so 10.7 kms later I do a slow slow slow walk home. If you notice I'm a tad ginger today that would be because I am!!!! Good news is I know I'll can run the 10km event next week in a heartbeat. Over half way there now and last week it was a battle, this week it is a breeze - although the cold glass of Sav Blanc (condensation on glass and all) that my wife left on the dining room table on Sunday night as she went to get the pepper mill was nearly necked. I blame the dehydration for the hallucinatory thoughts I was having (see Run Melbourne update as to why I was dehydrated). I did fight back the urge and am still going strong 17 days in. I don't know if the lack of a beverage is playing havoc with my grip on reality, but I do have a vague recollection of saying something along the lines of "I might go another month" out loud sometime yesterday - it could have been a fleeting thought that didn't come out of my mouth though (any witnesses??? How much do you need - money is not an issue???) You can donate via the logo on the right of the blog- funds are for the Royal Melbourne Hospital Cancer patients. Nine days in and it has honestly been a battle. The wife with a glass of wine most nights hasn't been too bad, but my niece's 21st on Saturday night was a tad boring sipping tonic water whilst these young kids were bouncing off walls. However that's not the least of it!!! To pick an event that swears you off the grog whilst in the middle of a Project implementation is probably not something I'd recommend, with the standard one week out panics, people blowing steam out of their ears because the process for getting hard copies of a document has changed, or arguing over whether the Deniliquin telephone exchange is in Victoria or NSW generally leads to one thing - a binge on a Friday night. Last Friday it was one tonic water and then a quick exit. Now I find out the wife's away with the kids for three days - what did that used to mean??? Poker, beer, sport and pizza, this time it will be a nice cup of herbal tea, a good book and maybe a yoga or meditation session!! Only three Friday nights to now conquer so will kill this one.